I am writing today to offer my heartfelt thanks to you for supporting your child’s interest in volunteering with Universal Promise in South Africa. Your endorsement speaks volumes of your trust in the school, trust in Universal Promise, global compassion, and understanding of the educational power of travel and service. We live in a big, beautiful world, and, in our view, the best education stems from traveling to its corners and learning from those who live there. The Xhosa have a philosophy of Ubuntu, which means, “I am because of you.” We believe this trip is an embodiment of that mantra. I am hopeful that conversations with your daughters and sons have highlighted why volunteerism of this nature is vital. Genuine, intense service raises awareness of the power of educational sustainability, the ripple effect of kindness, the commonalities of human beings, and the ongoing ramifications of systemic subordination. It also sheds light on true crises: those rooted in survival. I have led enough of these trips to know that each volunteer group has a different flavor and impact – all the result of the unique blend of talents, passions, and personalities of the volunteers. Your children brought qualities we cherish. When the passing of a former Vusumzi Primary School (VPS) faculty member led to the cancellation of school for the memorial service, the St. George’s students, without hesitation or complaint, developed lesson plans and workshops to keep the VPS students in school and engaged. Your children also shattered the stereotype of teenage cliques, seamlessly forming new friendships across all preconceived boundaries. When VPS children had a free period, your children “lassoed” them to teach anything from robotics to the construction of sundials to mathematics to computer keyboard mastery. St. George’s students learned Xhosa dance moves, shared their strengths (including anything from ballet to coding), and beaded alongside the Ilizwe Empowerment crafters, leaving them with a new appreciation of the complexity of the art form. Your children came to appreciate more of what they have, but they also came to appreciate that the warmth of the Xhosa people and their appreciation of life are worthy of emulation. On the last day, when your children climbed into the van to leave Vusumzi Primary School for the last time, students and adults in all directions were crying. While the tears meant different things for different people, they all spoke to the connections everyone had made across cultures, norms, and distances. That is why these kinds of experiences are priceless, and you helped make this happen. You played a key role in altering the expectations and hopes of children from Australia, China, India, Nigeria, Poland, South Korea, the United States, and, of course, South Africa. If you would like more information about how your family may stay involved, please contact me. All of us at Universal Promise, and all those we serve, would be sincerely grateful. Thank you. If you do not have WhatsApp, please download the application. For photographs, please visit the Google Doc link Ms. Bartnick and Ms. Buckles provided for you and are updating regularly. Thank you! Today’s bloggers are trip chaperones, Virginia Buckles and Emma Bartnick. Tuesday was our second day of the optional vacation workshops for grades seven through eleven. St. George’s students helped to run math review workshops and coding, and they assisted with art, crafting, reading/ storytelling, and group meetings with social workers. The math workshops were a wonderful opportunity for the high school students to get some individualized attention and focus on some foundational algebraic processes. I (Emma) spent the day running workshops in the computer lab with groups from grades 7, 10, and 11. We focused on keyboarding and some basic programming. In only two days, grade 7 students were able to nearly master the entire keyboard, and they could type complete sentences without seeing the keys. Computer literacy is in its infancy at Vusumzi, but a little bit of time, and a lot of focus from some determined students, goes a very long way. We are excited to see how everybody’s typing and Internet literacy will improve over the next several months. At the end of the day, the St. George’s students played soccer, netball, and various other games with the rest of the students. Some SG girls were proud to have gotten a few of the South African girls to join in the typically all-boy soccer game. We enjoyed one last beautiful dinner at Gerald’s Gift, where we were joined by three representatives of the Nal’ibali reading organization. They shared with us their passion for making reading a fun and active adventure. After we all enjoyed dinner, we celebrated Maya’s 16th birthday with cake, apple crumble, and “Happy Birthday” sung in both English and Xhosa. The Nal’ibali group then shared a story and song with us. It was a beautiful way to end our last night in South Africa. On our final morning in South Africa, we arrived at Vusumzi early so we could help set up the atrium in the Academic Center for the day’s showcase. After we hung the student artwork and finished all the preparations, we spent some time chatting and hanging out with the Vusumzi and Uphuhliso students. Once the showcase ceremony began, we celebrated the amazing accomplishments of the students from the last couple of days during vacation camp. Students showed off their skills in robotics, art, poetry, reading, and dance. We also heard reflections from the students who had been working with a social worker on issues of peer pressure. The ceremony was a beautiful way to finish off our time at Vusumzi. At its conclusion, we gave our final goodbyes to all the students amidst lots of hugs and photos and some years. Though we were sad to leave, we are so grateful for the memories and friendships made. It is hard to believe how quickly the time has flown here in South Africa! Today's bloggers are Diya (India) and Emilia (Poland). The students at Vusumzi are on school vacation, so today we participated in the first-ever educational vacation camp. Students in Grades 7, 8, 9, 10, and 11 came to school for a full day of lessons and activities. In the morning, we worked with the 8th - 11th graders in a math review of the first quarter. Each of the SG students took a classroom with one grade level and led a review of math topics the South African students have learned so far this year. This was quite a challenging task compared to the rest of our teaching experience because last week we worked worked with younger students, but it turned out to be beneficial to them and rewarding to us. During the rest of the day, we helped out with the coding lessons, reading education with a South African organization called Nal'ibali, and art classes. During the recess break and after school, we played fun games such as netball and soccer with the older students and the animal-clap game with the younger ones. It was so much fun! To wrap up our trip we went out for a lovely dinner to a popular restaurant called Tangelos. Given that this was one of our last days, we are trying to seize every opportunity possible! This has been one of the most memorable trips ever. We can't believe tomorrow is our final full day! Today's bloggers are fifth-former Lia (China) and fourth-former Tofunmi (USA). This week I (Lia) have been teaching mostly Grade 4 and Grade 5 math with Doris and Emilia. Since the students started learning English at school in Grade 4, we had the added challenge of a language barrier. However, the students are so eager and such fast learners that we were able to communicate with them pretty well. We focused on the topics of time and shape. During the time unit, we used the new art room to work on time and clock projects that made the learning experience more engaging for the students. They made sun clocks, played a lego block matching game, and designed movie posters. They mastered the time concept very quickly. Origami is the way we decided to teach shapes. We brought one math class to the science room and taught them how to do origami. We went over how to a fold fortune teller, house, and crown. After each fold, the students identified the shapes that they could observe in the new piece of paper. This project was the first time many of the students had encountered origami. They all loved it! After school, I have been crafting with the Ilizwe Empowerment Crafting Initiative. We have been making beading patterns that say “be you” on them. At first, it was hard for me to see the pattern and do it myself. However, as the week went on, after much help from the women running the crafting initiative, I started doing it more quickly and correctly. It became my relaxing time after a busy day of teaching. I (Tofunmi) have been teaching robotics classes with Natalie all week. We have been working with students in all grade levels. This weekend has been a break from our teaching schedule, and we have gotten to explore a little more of South Africa. Today, we slept in a bit, and then we headed to a nearby town, Valencia, to attend a portion of a church service. The service was lovely; my favorite part was when the children in the Sunday school sang for us. We also got to sing a song for the congregation. Since we had not prepared anything, we decided to sing "This Little Light of Mine" since everyone knew the simple words from when we sing it in chapel at SG. After the service we went to Port Elizabeth. Our first stop in Port Elizabeth was an open-air market. Each of the little stands had a wide range of items and souvenirs. Some of us got to test out our haggling skills. I bargained and get some souvenirs for my family. We ate at a restaurant right on the water and then walked to The Boardwalk, a shopping center right by the beach. Some of us bought a few more souvenirs, and many of us bought an ice cream. The last place we went before heading back was Hobie Beach, where we took a picture together before splitting up: some people wanted to go for a swim while others just wanted to dip their feet in the Indian Ocean. I stayed with the people who wanted to dip their feet in. We drew in the sand while we waited for the swimmers to come back. It is hart to believe that there are only two more full days in South Africa! We both had great weekends, but we are excited to get back to school. Tomorrow we will be helping out during the vacation workshops at Vusumzi. These workshops have never been offered before in the community, and Universal Promise is eager to see how they are received and if we should be implement them during each vacation period. Today's bloggers are fourth-former Andrew (USA) and fifth-former Natalie (South Korea). I, Natalie, was given a Xhosa name, Sisipho, which means “gift.” Throughout this week, I have mainly taught robotics to all the grade levels with Tofunmi. I have also taught origami. It was great getting to know all the students in different grades as I introduced these new subjects to the students at Vusumzi. Outside the classroom, I have participated in activities such as crafting, dance, and soccer. I, Andrew, have been teaching English to students in Grades 4 and 5. I have also been helping out regularly in the Grade 3 math class. Outside the classroom, I went to the crafting workshop Monday - Friday. There I learned how to make bead banners that have “be you” stitched into them. This work has been a fun way to learn a new skill that I never would have learned if I hadn’t come here. Since today was a weekend, we took a break from teaching and, instead, went to two different parks to see wildlife. First we went to Daniell’s Cheetah Project to see various types of cats. The cats we saw ranged from meerkats to the kings of the jungles themselves: LIONS! We all agreed, though, that the cheetahs stole the show. We had an opportunity to take a photo with one of the cheetahs. We were able to get up close with their friendliest one. After an hour of seeing the cool cats, the group was ready to eat! We drove to the Addo Elephant National Park and had lunch before going on a safari tour. Early on, the group was delighted to see elephants in their natural habitat. Following those sightings, we saw warthogs (our tour guide called it a Pumba), rare buffalos, zebras, and multiple types of antelope and kudu. Once the safari was over, the group returned to Gerald’s Gift to get dinner and rest. Tomorrow we are off to Port Elizabeth. Time is flying! Today's bloggers are fifth-former Lucy (USA) and fourth-former Liam (USA). We started the day early to make it to Vusumzi where the students gather for their Friday morning assembly. The children sang a few songs, and the teachers made a few announcements. All of the kids are such talented singers, and they sounded beautiful together with their multipart harmony and unmatched confidence. I (Lucy) taught Grade 7 math with Katie and Maya. First, we had them write down the definitions of variables and input and output values so we could show them how to replace an X variable in an equation for an input value. Then, we broke the class into teams of seven and had them work together to figure out three math problems on the board. The first team to answer all the functions correctly was the winner. In the second part of my morning I went to robotics class with Andrew, Natalie, and Tofunmi. Natalie and I built a maze the night before, so that the next day the students could program their robots to find their way to the end. During our break we took a bunch of photos with the children. The students also sang "Happy Birthday" in Xhosa to Tofunmi! After the school day many of us went to crafting and did beading patterns to put on cards that we will sell back at SG. I (Liam) taught a math class today to Grade 5 students with Doris, Emilia, and Lia. The students reviewed time using Lego blocks with clocks on them. They each had a few blocks and searched for matching blocks that the other students had. It was a lot of fun, and they seemed to understand it well. Afterward, I helped clean the dance studio with some of the children. The purpose is to help the students understand the need to care for and protect this beautiful new space. They were all so helpful and kind. After this was finished, we spent time with the children. Lots of hugs and smiles were shared. We had lunch afterwards, and I had a delicious Nutella sandwich in addition to cake and ice cream for Tofunmi’s birthday! Next, we finished the day at Vusumzi by picking up trash around campus with the children. Finally, I went on a short drive into the neighborhood of Molly Blackburn, where the Ilizwe crafting initiative is stationed. I continued to work on my beading project, which was pretty challenging!. At the end of the school day, we all got in the van and went to the home of Mrs. Banda, a local beader who makes the most beautiful beaded jewelry. Many of us purchased necklaces, anklets, and bracelets. Overall, today was a great day. We are looking forward to the safari tomorrow! Today's bloggers are SG third-formers Katie (USA) and Laila (USA). Today was another great day at Vusumzi. As we were driving into school, a few children greeted us at the van and were shouting our names. It was so sweet. We weren't expecting them to remember our names yet! We all waved back and greeted them with hugs. At Vusumzi I (Laila) teach science. We are working on a project with the students that exposes them to the research process and helps them practice presentation skills. Today I took half a class to the computer lab. We practiced using the search bar to find information to help them with their projects. The joy that it brought them to search for that information was like nothing I’d ever seen before. This was the highlight of my day. It made me realize the privileges I have in my own education. After school I helped tutor students that were having trouble in math. After that I went to Girls’ Club where we talked about what it means to be a girl in South Africa and in the USA. It was eye-opening to hear the girls discuss the issues that are concerning them right now. I, Katie, was given a Xhosa name, Khanya, which means “light, a sense of direction.” I started off my school day with the children from Grade R (which is equivalent to kindergarten in the US). They are so adorable, and they absolutely love hugs! They do not yet know much English, but the language barrier didn't stop us from having a great time. I taught them "Duck, Duck, Goose." They loved it! Then I took half of Grade 4B to the art room. The other half went with Leila and Ashley to continue their research on their favorite animal. In the art room, the kids made posters about their favorite animal using colored paper, paints, and colored pencils. They were able to get creative. After lunch I helped Robin and Liam rearrange one of the tutoring classrooms that was in need of some organization. Later in the afternoon I helped tutor students in Grade 7 as well as some students from the local high school in math. Tutoring is very satisfying because you are able to work with kids in smaller groups, and you can move at a slower or faster pace depending on the students' needs. Then I participated in Girls' Club, where a social worker talked with us all about growing up and becoming young women. We arrived back at Gerald's Gift with enough time to shower and relax before dinner. Tomorrow is our last normal school day, and we hope to spend much more time with the children, and make the time we have left as enjoyable for them as it is for us. We can't wait for tomorrow! Today's bloggers are SG sixth-former Ani (USA) and third-former Bella (USA). Today started with a delicious breakfast the lovely staff at Gerald’s Gift provided, after which we all loaded into the cars to head to school around 8:30 AM. Today there was a memorial service for a former member of the Vusumzi staff who recently passed away, and the teachers were required to attend. As a result, it was an official holiday from school, but the students in Grade 4, 5, 6, and 7 so badly wanted to go to school and work with the Universal Promise volunteers that we held a shortened day of classes for them in smaller, more personal groups to teach English, math, art, and Robotics . I (Ani) taught English with Robin. In Grade 6 we had them read a story and conceptualize it through pictures; in Grade 5 we had them form sentences from pictures and then pictures from sentences, and in Grade 7 we worked with them on parts of speech and poetry. The school day ended a bit early, at 1 PM, after which the volunteers dispersed into their afternoon activities. I went to crafting and continued making the beading patterns we are creating to put onto cards. We also gave the crafters orders for anklets that they will make for us before we leave, which was a lovely thing for them to do. Today I (Bella) received a Xhosa name from a Vusumzi student! The name is Bomibenthu, which means “our lives." Today I also taught art to grades 5, 6, and 7 with Ashley, Diya, and Leila. All our classes met in the new Universal Promise Academic Centre. We helped Grade 5 students begin a self-portrait project. We taught Grade 6 students how to make homemade scratch art, and Grade 7 students used poetry they had written in English class to inspire drawings. We hung many of the art pieces up on the walls in the art room, and the students loved seeing their work displayed! During the morning recess, Ms. Bartnick and I taught an optional introduction to ballet class, and many of the students joined in. It was really fun to teach them a type of dance they hadn’t seen before. After school I participated in the afternoon traditional dance program and learned some dances from the same girls I taught earlier. It was extremely hard! I cannot wait to start another day teaching and learning new things! At the end of our day, we went to Lenmore (a grocery story/restaurant) and ordered pizzas for dinner and shopped for some snacks to have back in our rooms at Gerald’s Gift. We are excited for another day at Vusumzi tomorrow! Today’s bloggers are SG fifth-formers Ashley (USA) and Doris (China) and fourth-former Maya (USA). We hopped in the van around 8:30 AM to head up to Nomathamsanqa, and everyone was carrying robots, books, and other school supplies. The sun was out again, and we were all feeling ready to get back to work. Once we got to school, we unloaded the van full of our lunch food and headed into the teachers’ lounge. Those who were scheduled to teach went to their classes, and those who weren't stayed back and helped put together the mini-robots we had brought for some lessons on robotics. Later on that day, Natalie and Tofunmi led a class to teach the kids how to use them. Prior to the trip, I (Ashley) decided to help out with natural sciences in the 4th - 7th grades, and today I was with the 4th grade. Laila, Katie, and I assigned the children a research project and asked them to name different animals and identify where those animals live. We then split the class into two groups: one half went to the art lab and the other half to the computer lab. The art lab group painted its favorite animal and prepared posters for the research part. The other half used the laptops in the computer lab to look up what their favorite animal eats, where they live, what specific features they have, and a fun fact. Having never used Google before, the students were at first a little nervous, but Laila and I helped them navigate the Internet, and once they saw all the information pop up, their eyes lit up! It was such a heartwarming experience. It is amazing how the smallest things can make these children so happy. After school, I helped out in the tutoring sessions. I sat with a group of 8th graders and taught them how to simplify expressions with square roots. After tutoring, I attended the Girls’ Club. A social worker runs the workshop, and she began to talk about self-esteem. We were all instructed to select a song that expressed who we were and then present it to the group. We finished the session with sharing what we had learned. It was such an amazing day, and I cannot wait until tomorrow! Today I (Doris) taught Grade 4 and Grade 5 mathematics. Lia, Emilia, and I taught two Grade 4 classes how to read time and how to convert time on a clock to digital form. We reviewed the difference between the minute hand and the hour hand, and that there are 60 minutes in an hour. We gave them the worksheet that we prepared for them, and then let them design their own movie posters. They had to write three different times that they wanted their movie to play, both on the clocks provided and in digital forms. Although some of them were struggling a little at first, most of them were able to understand us and finished the worksheet really well. After lunch, Lia, Lucy, Andrew, and I played with the kindergartners for almost an hour. Then we went to assist Ms. Bartnick and Martha when they were teaching Grade 6 math. We reviewed the order of operations when working on a function, introduced the concept of negative numbers, and taught them to calculate. After school, a group of us went to the crafting center to continue our project. Crafting was a way for me to relax. I love doing craft works, even though it wasn’t really easy for me in the beginning. Back at Gerald's Gift, we relaxed for a while and then enjoyed a curry dinner with homemade apple crisp for dessert. We are looking forward to tomorrow! I (Maya) am teaching Grade 5, 6, and 7 math while volunteering in South Africa. Today Lucy, my teaching partner, and I reviewed angles with Grade 6 and introduced the properties of exponents to Grade 7. Later in the day, I taught an English lesson on poetry to Grade 7 alongside Robin, Ani, and Bella. Because it was our second day, we knew much more about what to expect, are getting used to the schedule and life in Nomathamsanqa, and are picking up on things nicely. We are also making great progress with the Vusumzi students. After the school day, I went to craft with Ilizwe Empowerment, a social enterprise, and made a card with a seed-bead phrase on it that said, “be you.” Crafting is the part of the day when I relax and unwind. I absolutely love it. Once we returned to Gerald's Gift, we relaxed for a while and then enjoyed a curry dinner with homemade apple crisp for dessert. We are looking forward to tomorrow! Today’s bloggers are SG fifth-formers Diya (India) and Emilia (Poland). Today was our first day working at the Vusumzi Primary School in the small village of Nomathamsanqa, South Africa. Though we were a bit jet-lagged from the travel, we were all so eager to visit the school. Today we arrived just in time for the morning assembly. We were greeted with a few traditional songs, which filled our hearts with joy. I (Diya) taught English to fourth graders. We read passages aloud and practiced reading comprehension skills. When the bell rang for recess, we were overloaded with cuteness, hugs, and high-fives from all the children. I thought the SG students came into the school with a lot of energy, but the children outdid us. My favorite moment of the day was during after-school tutoring, when I worked individually with some children. I (Emilia) was also working with an English teacher at Vusumzi. I brought my students into the brand new art room to practice color vocabulary. We talked about primary colors and secondary colors. My high moment of the day was meeting with Middle and Upper School girls alongside a local social worker. She talked with them about female empowerment and self-confidence. It was wonderful hearing from so many thoughtful, aware young girls. After school, we hung out at Gerald’s Gift for a bit before a big pasta dinner. We spent some time talking as a group about teaching strategies and sharing our highs and lows of the day. We both feel very grateful to be here, and are excited to get back to Vusumzi tomorrow. After a long thirty-two hours of travel, our group has finally arrived in Addo! The travel was pleasantly uneventful, and though we are all tired, we are thrilled to be here. Martha met us at the airport, and our group made the 45-minute trip to Addo. Upon our arrival to Gerald’s Gift, we were greeted enthusiastically by Beatrice, Gloria, Joyce, and Norah, members of the staff, as well as the girls from Norah’s dance troupe. The women and girls welcomed us with amazing singing and dancing. We then dispersed to our rooms and took an hour to shower, unpack, and settle. We gathered again outside the fire pit where we were treated with another round of song, dance, and poetry. They are all so incredibly talented, and we loved seeing them perform and chatting with them afterward. Sue and Roger, the owners of Gerald’s Gift, then provided us with a delicious home-cooked meal (complete with ice cream sundaes as dessert!). After we ate, Emma, Virginia, Martha, and Robin (the fourth chaperone from UP) reviewed the rules as well as the plan for tomorrow. Then we distributed travel journals, and everyone was asked to write for ten minutes. We will have a designated time for travel journals each night as a way to remember the trip and process everything we are learning and seeing. We finished the evening with a few name games to get to know one another better, and then dispersed for a bit of free time before room check at 9:00 PM. We are so looking forward to our first day at Vusumzi Primary School tomorrow! Communicate with family and friends only when back at the lodging. Use your cell phone and social media only when back at the lodging. Do not post any photographs, blogs, etc. without permission from Universal Promise. Do not share personal contact information with those we serve. Do not give away any personal items or money to those we serve. You must lock your checked luggage. You may purchase TSA-approved locks on Amazon or AmazonSmile. Get your seat assignments now, and pay attention to your luggage allowance. Consider buying space-savers. Definitely buy an electrical adaptor and compression socks for the long flight. Exchange currency in advance, as you may not have time to do it in Johannesburg. You will need money only for personal expenditures, such as laundry, souvenirs, snacks, etc. All your meals, your lodging, and the safari are covered. It will be summer in South Africa when you’re there. The South African March is similar to the United States July - so pack accordingly. Wear appropriate clothing. Do not bring expensive jewelry. There is laundry service at our lodging, so you may bring less and pay to get your clothes washed. Consider bringing a backpack, a bathing suit, a hat, a rain jacket, sneakers, sunscreen, workout clothes, and a power strip. We are also asking anyone who is willing to help carry over some items Universal Promise has collected to donate. Each teaching pair will be required to design two lesson plans to carry out at Vusumzi Primary School. Each pair will design these plans based on the educator requests. Each pair will present the lesson plans at our next meeting. The group departs from the USA to travel to South Africa. The group arrives at Port Elizabeth International Airport in South Africa and is met and transferred by vehicle to Gerald’s Gift. After breakfast, the group takes a guided tour of Nomathamsanqa and arrives at Vusumzi Primary School, where it will receive a Xhosa welcome from the students and meet the educators and staff. The group jumps right in and starts to teach art, computers, English, math, robotics, and science. Each day the group will have lunch together, process the day’s events thus far, and discuss the afternoon logistics before heading back to the classroom for final classes. 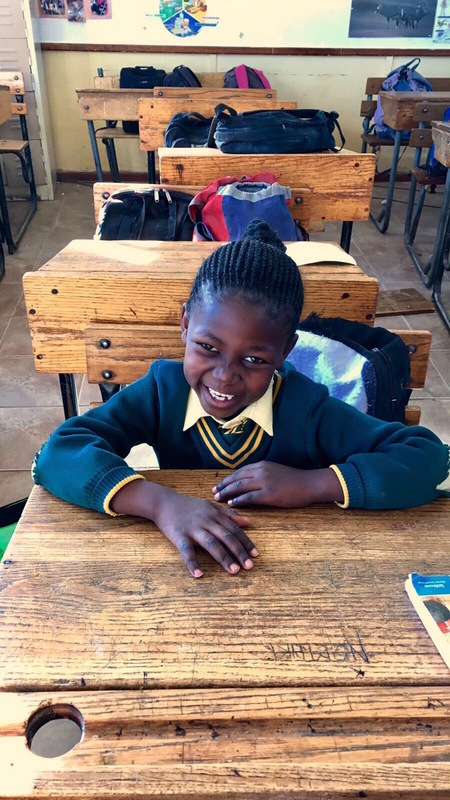 Once classes wrap up for the day, the group will participate in an afternoon activity of their choice, including tutoring, Ilizwe Empowerment Crafting, cultural dance instruction, and reading clubs. Following these sessions, the group will return to Gerald’s Gift where the students will have some free time. During this break, we encourage the students to check in with loved ones. The group will then dine either on-site or at a local restaurant. Before heading to bed, they will discuss the day’s events and plan for the next day’s activities. These days will essentially follow the schedule as noted above under Day 3. After breakfast, the group will head out for a morning safari at the Addo Elephant National Park. After lunch at the park, the group will visit Daniell’s Cheetah Project to see rescued cats, ranging from meerkats to lions! Following this visit, the group will return to Gerald’s Gift where the students will have some free time. During this break, we encourage the students to check in with loved ones. The group will then dine either on-site or at a local restaurant. Before heading to bed, they will discuss the day’s events and plan for the next day’s activities. After breakfast, the group will spend the morning at a local church service to enhance its understand of the local culture. After church, the group will visit the seaport locale of Port Elizabeth, where they will browse at a local market that sells wares from across the continent, dip a toe in the Indian Ocean, and visit The Boardwalk, a tourism hotspot. Following this visit, the group will return to Gerald’s Gift where the students will have some free time. During this break, we encourage the students to check in with loved ones. The group will then dine either on-site or at a local restaurant. Before heading to bed, they will discuss the day’s events and plan for the next day’s activities. After breakfast, the group will spend its days at Vusumzi Primary School and will continue to be fully engaged in academic classes. UP has structured “special” educational workshops for primary and secondary school students, including coding, drawing, painting, mathematics instruction, reading clubs, and robotics as well as some athletic activities, including netball and soccer. The group will visit Vusumzi Primary School to say its goodbyes before being transferred to Port Elizabeth International Airport, from which they will travel to Johannesburg and then to their ultimate destinations. The group members will arrive at their final destinations.